We Are Completely Full At This Writing! But there is a waiting list for spaces and there are opportunities to partner with existing tenants. Email us for more information. GTFIH leasing information is available below, or by downloading a printable Adobe PDF of the document. Leasing information may change over time. We attempt to keep this as current as possible. 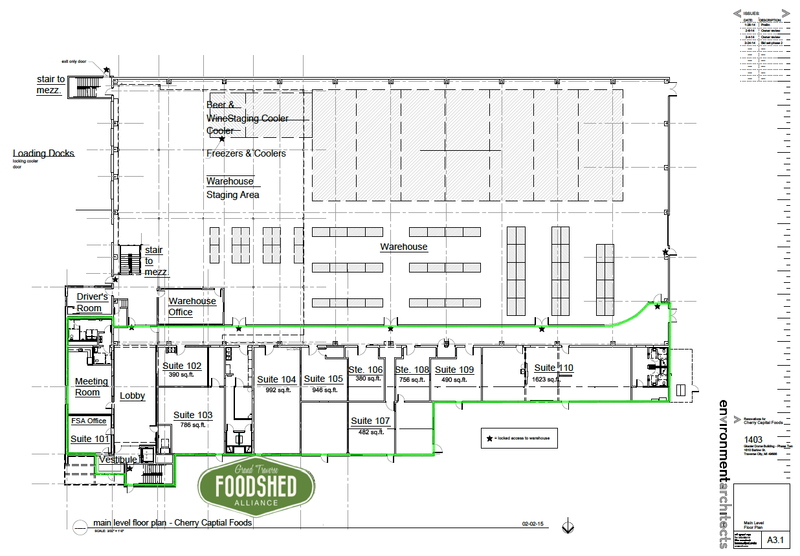 There are ten suites within the Grand Traverse Food Innovation Hub facility (GTFIH). All units are newly renovated and “white-boxed”, ready for your customization. Utilities are subbed off inside each unit, allowing for individual metering and hook-up requirements with minimal extra expense. Potential effective uses of GTFIH spaces include: wash, pack, sort, value-added food manufacturing production, packaging, food science laboratories, and more. All units feature private entrance, shared bathrooms, shared shower facility, access to Cherry Capital Foods’ distribution, cooling, and storage amenities by arrangement. All but two units have external doors opening to the parking lot, and internal access into the shared service-way with Cherry Capital Foods. All suites are manufacturing/processing only. No on-premise retail sales are allowed. The GT Food Innovation Hub is more than simply an address to call home for your business. It is a community of food entrepreneurs with shared objectives and values. In addition to other GTFIH tenants, we offer access to a network of growers, processors, distributors and retailers all with the aim of selling more local food. A full range of product and business development services, mentoring, business counseling, access to capital and shared resources are available to tenants. Prices are set far below market, but will scale up over time. So get your space early. To download an application click the link, visit our website, or contact us at the address listed above. SIZES: Suites vary from 380 sq. ft. to 1,623 sq. ft.
CITY: Traverse City / Garfield Twp. DIRECTIONS: On west side of Barlow, 1/2 mile north of South Airport Road, behind Barlow Center. For reference, Suite 105 at 946 sq feet x $6.75/ft would have a first year leasing cost of $6,385.44/year or $532.12/month. An additonal shared space fee (not to exceed 15%) will be assessed for management and care of shared spaces. Shared spaces include access to kitchenette, bathrooms, showers, and coordinated use of the lobby and meeting room areas. Adjacent off-street parking is provided for tenants. Download this page as a PDF document.